Nine people were injured, one of them seriously, when a commuter omnibus ploughed into a pre-cast wall at the corner of Glenara Avenue and Robert Mugabe Road in Harare yesterday.The accident occurred at around 2:30pm near Odzi Flats. The injured were taken to Parirenyatwa Group of Hospitals. Witnesses said that the commuter omnibus, which was coming from Mabvuku heading towards the Central Business District hit a Daihatsu coming along Glenara Avenue that had failed to give way. After hitting the Daihatsu, the kombi then collided with a Nissan Hardbody truck coming from the opposite direction and finally hitting the wall. 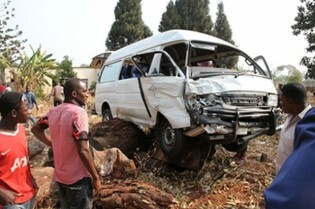 Among those who were injured were the kombi driver and eight passengers. A witness who declined to be identified said: “The driver of the Daihatsu did not give way to the kombi and the driver failed to stop. The passengers managed to get out of the vehicle when the vehicle had stopped. However, the driver mistakenly stepped on the accelerator causing the vehicle to move forward hitting the pre-cast wall at a nearby house,” he said. When reached for comment police national traffic spokesperson Assistant Inspector Luckmore Chakanza said he could not give details as he was off duty.